The solar eclipse is only 43 days away! Have you made plans? I'm elated that we are so close to the path of the eclipse since we will not be able to make it out to Wyoming this summer. My piece, "Bargaining" was accepted into the show, SOLAR, hosted by the Potter Art Gallery at Missouri Western to coincide with the eclipse. The show will open from August 7th to September 15th. Friday we drove the piece up to the art gallery and had a fun little museum/art vacation along the way stopping at the Walter Cronkite Memorial, and then down to Weston, MO to see the Nation Silk Museum. This collection was unbelievable. It was silk tapestries from around the 1700s to the early 1900s. The time and attention to detail to create these pieces was astronomical. Then you look at the weaving and it's clear like a photograph. The museum curator said they have the resolution of our HD tv. If you have the ability to stop and check out the collection it's well worth the drive. We also got to see the reverse sides on some of the tapestry. This little shepherd girl is extra creepy in reverse. It's the end of summer and the end of fair season. I'm always a little sad to see the last day of the Missouri state fair. This week has been just plain hard. We've been adjusting to life as normal and I feel my wheels spinning. I'm in this weird mental space where I'm kind of putting off art until September. In a week I'm going to start the 30 in 30 challenge, Bea will start preschool three times a week, and I'm going to be starting classes through Artist Inc. It's all a little overwhelming and it has put me in this place where I don't feel creative or capable. Maybe I'll just go hide in my garden. Despite all these feelings, I've still started a project that uses emotive drawings and quantum entanglement. I'm drawing on a giant roll of receipt paper. I'm envisioning myself as one particle communicating to another particle across an entire universe. What would I say? What would be worth knowing on the other edge of the universe? The weather cooled down a little this week so I took Bea out on an epic quest to collect some walnuts. I'm going to make some walnut dye or ink. I've looked at a few recipes online and did manage to find an old stainless steel pot at a thrift store. I picked these walnuts off some low lying branches so I don't know if they are too green for making dye. I'm going to start off with what I have and if they don't work then I'll get some more in September or October. I'm looking forward to harvesting some to eat too but I think it's still too early. Dying adventure! Here we go! Kubo and the Two Strings opened Friday; Bea and I were right there standing in line for the opening. We've wanted to see it since we saw the trailer last year. It has all the stuff I enjoy...origami, shamisen, adventure, monsters, sassy monkeys... Bea has been a total fan girl ever since, complete with top knot and cardboard shamisen. She even the insists that we call her Kubo. Ian and I experienced the fun of constructing a shamisen out of cardboard. It even makes different tones. I'm a little proud of our toy-making skills. Bea's best intimidating Kubo face. Reading: Year-Round Vegtable Gardener by Niki Jabbour. Maybe I'll try growing a fall crop. Listening to; The Conversation Podcast. It's about art and artists and I'm learning a ton. Cooking; Left over taco experimentation day. My best combination so far, baba ganoush, ham, pickled pablano peppers and lettuce. Monday was my 30th birthday and I spent all of it in the car driving back from our epic summer vacation in Wyoming. Which means, I had plenty of time to contemplate being 30, art, and what the rest of our life is going to look like. I can't help but remember being 20 and telling everyone that I would take over the world by 25. And then the exhilaration and trepidation of celebrating my 25th birthday in Japan, just after the earthquake, newly married, and new to the military. This life feels like mountain climbing with all it's ups and downs; bravely soldiering on. My goal for 30 and the next ten years will be to care less about other people's opinions about what you are supposed to do, how you live life, etc. I'm going to try and be brave enough to make choices that work for me and stick to them. My goal is to be my authentic. I'm not sure what that is going to look like yet but I'm excited to find out. As for art, I still want to keep creating art now more than ever. I want to make work that interests me and that I'm proud of. I want to work with other artists and create a community. Most importantly I want to keep traveling, learning, and creating a beautiful life. While I was thread painting at the beginning on our vacation, Bea pulled all the paper sleeves off my DMC floss. I realized that I needed to do a complete over haul of how I stored my threads. For too long they have been stuffed into a plastic sheet container or my metal ice skate box. Inspired by the thread organization which Penny has at her shop, Ewe Count in Cheyenne Wyoming, I set out with Bea to buy rings and some curtain rod brackets. Voila! Now Bea thinks that we own a thread store, which makes me laugh because I sure do have a lot of thread. Everything that has a hole for a ring is displayed on the curtain rod and everything else is placed in a little Floss A Way bag and hung on the hanger too. I'm going to go back and sort things a little bit better by color once I have more rings. The thing that concerns me is light fastness and dust accumulation because they are hanging out in the air. Look at all the browns and greys I have? Look at how little red I have. Maybe I need to do more shopping. And this isn't even all the threads I own! In big news, I'm in a show in Kansas City! Wahoo! Stop by Gallery Eight One Five to check out my collages. I'm bummed I can't make the opening tonight as I'm sure it'll be a blast. The giant burrito that I mistakenly ordered on my birthday. Reading: Marrying Winterborne by Lisa Klepas; I blame my mother for my romance book obsession. Cooking: Kombucha! The sister-in-law gave us a skoby and we've started our first batch. The alien creature that came home with us and will make us a delicious fermented beverage. Read about how to make kombucha yourself here. This week we were Thermopolis, Wyoming with my in-laws for the Big Horn Basin Folk Festival. My in-laws were selling their jewelry line made of rawhide at the festival and teaching my daughter how to be "the cat who sells". We all had a lot of fun with the different art and craft demonstrations plus all the beautiful things to see at the Hot Springs State Park. We went to the parade in Thermopolis on Saturday morning so that Bea could collect some candy while we walked around and collected Pokemon. At the end of the parade, there were some traditional dances performed by the Shoshone tribe. I was so inspired by how they worked in contemporary fabrics and colors into their ceremonial dress; the color combinations and applique were gorgeous. We all had fun participating in the friendship dance. We Got Stuck in a Bison Traffic Jam: They all just started crossing the road at once. They are so big and unpredictable that you never quite know when it's safe to sneak by them. 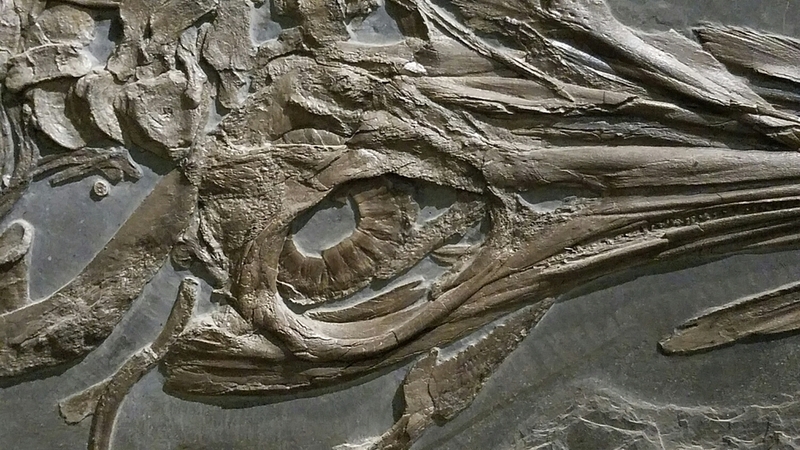 Toured a spectacular Dinosaur Museum: I took so many cool pictures of fossils and how museum displays are put together. Monster Truck Rally: I'm embracing my redneck heritage. Saw Some Crazy Cool Thermal Pools: This is just one of many. So many more amazing pictures to come. The words "Plein Air" are usually accompanied by the word "Painting", but who follows tradition. Last summer, I embarked on an artistic adventure at McKendree University to create Plein Air Embroidery. Embroidery can be called painting with thread, after all. My professor, Amy MacLennan, invited me knowing I don't paint; I didn't disappoint in bringing the fiber or the crazy. We are going again this year but we are going to be a little crunched for time. I get one whole day of embroidering/painting in the ridiculous Illinois heat while the mister and kiddo go sight seeing in St. Louis. I've decided to approach this a little differently this year and just do straight stitching and I might even try to do a little watercolor. So what does a fiber artist bring for plein air embroidery? Table cloth or plastic sheet - you've got to sit on something. I'd really love a collapsible stool but I don't have the room in the car this year. Water bottle - It's gonna be the surface of the sun out there. Stay Hydrated! Good pair of thread scissors - I have mine on a string around my neck. Hoop - Stretches and frames the work instantly. Paper - To stretch or not to stretch? Pastels - Because... why not? I'm pretty excited. Maybe I'll go down town and and sit in a shady spot and work on some perspective. There's all kinds of crazy things I could try: incorporating found textiles or thread into my embroidery, stitching into the watercolors. The ideas are flying! Work continues on the mural. It's beginning to look a little bit more polished with those brush strokes disappearing. My theory is to start in the upper left corner and work my way down and to the right. No palms smearing paint. Farm Report: Yet another batch of dill pickles canned and we have decided to experiment with left over brine and make refrigerator pickles. We'll see how they taste in four days. I'm really looking forward to the baby eggplant. It feels like the surface of the sun here in Kansas City, which is the perfect time for an urban garden tour. Thursday I went out with a few ladies from the garden club to look at 18th Broadway rain garden. According to our guide, the city block was bought just before the recession to build condos. Since that idea didn't pan out they created an urban garden to prevent the site from eroding into nothing. What's amazing about the space is that it is almost entirely run on rainwater and solar power. The structures built to retain run off from the surrounding area and to filter the water was particularly fascinating but not terribly photogenic. I just love the green things growing in the middle of a thriving city. It's pretty amazing the variety and shear tonnage of produce that is grown here for local food banks. Plus it's all organic, which is quite the feat with fruit trees. They grow peaches, apples and cherries. The wheel is turning in a few of our heads on how to bring a community garden to Knob Noster. Maybe not something as large and grand but a community growing place for people who live on base would be nice. I've been working on putting together some bags from vintage kimono for the Creative Hand Show & Sale coming up in November. 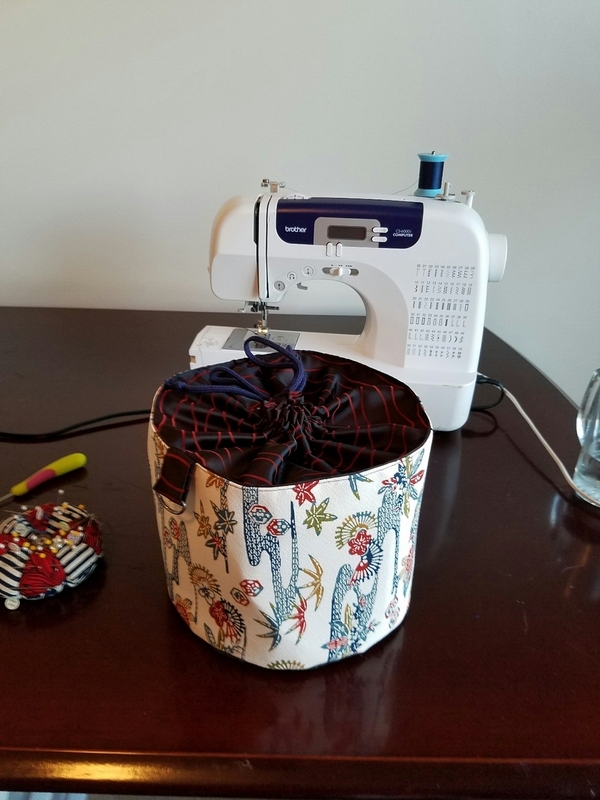 I designed this and despite my lack of knowledge about sewing in the round it came out really well. It's a project bag fro a larger knit or crochet project. I saw something like it in a knitting shop once and it's been on my mind ever since. It's even fully lined. I like what the pattern of the contrasting kimono does when it's closed at the top. I know I need to sell it but part of me wants to keep it. The curse of making things you enjoy. Cool Stuff: I'm going to be plein air embroidering again this year at McKendree University in Lebanon, IL. I'm getting all prepped and might even try watercolor this year. Gasp. Two weeks before epic road trip and stretching my art chops in the murderously hot sun. Farm Report: My tomatoes are finally ripening! I've been jamming up a storm. My first attempt with pectin this year was peach jam and I made the mistake of following the pectin instructions. Way too much sugar! Not only is it almost too sweet to eat but it set so hard that it's almost unpleasant. I looked for a low sugar recipe for my seedless blackberry jam and found the perfect ratio for sweetness. 1/2 c sugar for every cup of fruit. Then you can add 1 1/2 TBS of pectin for every cup of fruit. It set up just fine and it's edible. What's with American's and over sweetening things anyways? Playing: Lovers in a Dangerous Spacetime - The mister begged, I'm giving it a try and we haven't died horribly just yet. This weekend our Aunt was in town visiting and we enjoyed showing her the best of a Missouri summer. We picked five pounds of blackberries on Saturday at Buckeye Acres in Warrensburg. It was so hard to stop! Today I start canning seedless blackberry jam, one of my Dad's favorites. I received a lot of great news on the art front this weekend. One of my pieces was selected for the Missouri 50 at the Missouri state fair, a fiber sculpture, surprisingly. If you are in Sedalia, MO between August 11th and 21st swing by the fine arts building and check out all the awesome art, a great show to be had by all who attend. Drum roll, please...and the best news of all: I was selected to participate in this fall's Artist Inc Program! I'll be attending six weeks of art business school with 25 other artists. This will be an incredible opportunity for me to network and talk to other artistic professionals. I'm incredibly nervous and excited! Friday, I tried selling my work for the first time at an artwalk. It was small and low key but there were plenty of laughs and smiles. I was parked near a Pokémon stop and in the shade, so no complaints here. I got a lot of help from my daughter, the self proclaimed "cat who sells." My own artist in training, the "cat who sells"! We began teaching Aunt Li-Anne to Pokemon Friday night. She thinks it's fabulous, except for all the glitches. If you've seen odd packs of roving teenagers all looking at the screens of their phones and pointing at random things then you've seen Pokemon Go players. The app was released earlier this month and has been blowing up the internet. Ian was a huge Pokemon player as a kid and wanted to share the love of collecting little creatures with Bea. I'll admit that I never played it as a kid and was a little wary. I'm hooked now, though I say I play it for Bea. We created a character inspired by Bea's ninja persona that wears a lot of yellow. Yellow is her favorite color right now. The game uses land marks on google maps and your phones location to orientate your character in space. You just walk around and your phone will buzz when a Pokemon is present. Then you throw pokeballs at it to capture it. As lame as my description is, playing is actually really fun. We find the Pokemon and then Bea comes up to flick the pokeball at them. This game resulted in us spending Sunday afternoon driving around Knob Noster looking for lures and landmarks where we can get pokeballs and eggs. 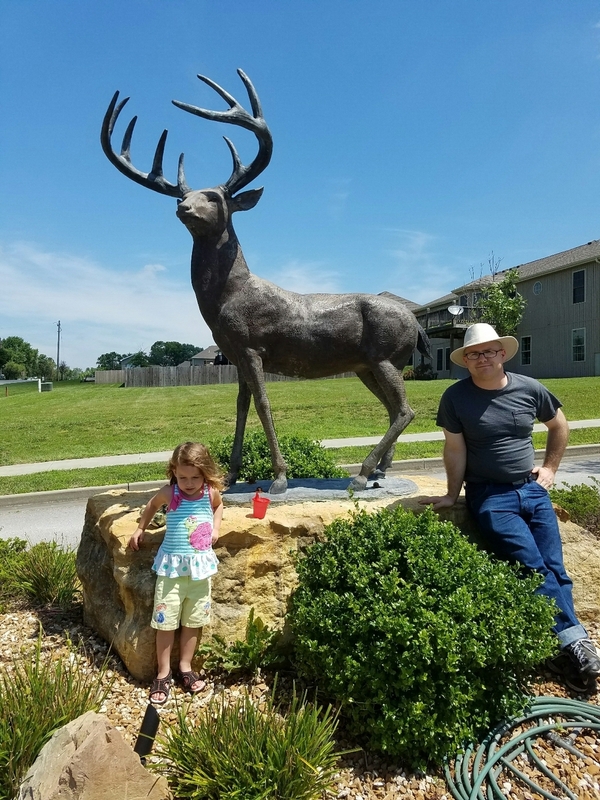 We kept finding the weirdest things like a deer statue in a subdivision and an old B2 mural down town. We also met some odd people. Outside a church in Knob we met a pastor and had a conversation about teams in the area and how we could use the pokemon lures for public events and such. It's a little mind blowing all the gamers congregating outside in packs. For our evening walk we found random groups of adults hanging out at the park, a lure spot in the game, waiting to capture pokemon. Maybe tomorrow night they will bring their kids. It's epic how much exercise you get in this game. You have to walk, yup it can tell when you are riding in a car, in order to incubate the eggs you get. You also have to get out of your car in order to get close to monuments. I just found my new exercise app! I totally recommend you try to collect them all!